By this PKI 4710, a direct localisation of hidden monitoring transmitters and other unknown transmitting objects, whether room-, telephone-, GSM or video related devices, is guaranteed. For many years our team of experts has been concentrating on latest developments of detection devices in order to provide our customers with best possible products for each and every task. 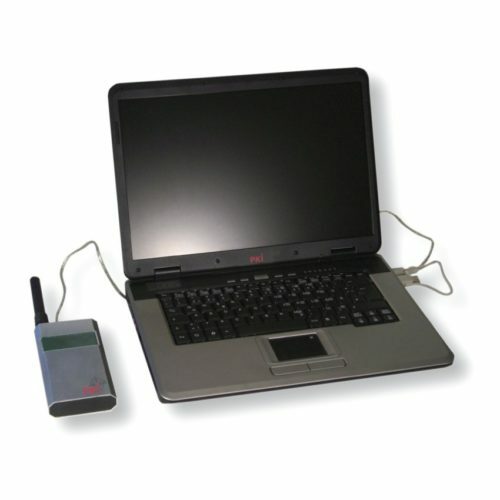 This highly sensitive but small and handy near-field detector allows transfer via cable of all received information onto a laptop and by another connection directly to a suitable scanner to get the sound. On both, the laptop and/or the optional scanner, the required adjustments and storage can be effected. The more you approach the suspicious object the more the beam-indicator on the PKI 4710 will increase from left to right plus an audible alarm, additionally presenting the absolute correct frequency on its 10 figures LCD display. By all of these three indicators the localisation of such suspicious transmittng sources is most easy. We strongly recommend this device for any sweeping operation, as for example for the police for the fight against terrorism and criminal acts, or for special forces acting against each kind of espionage as well as for military and industrial security forces.